The Scottish National Party has denied U-turning on its policy for funding public sector building projects including schools and hospitals. It has been accused by Labour of ditching its previous hard line on PFI and copying its policies instead. The SNP's manifesto said that public bodies would be able to choose how to fund building projects. The Tories said the SNP had much to explain and the Liberal Democrats said the plan would cause conflict. 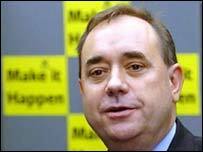 Alex Salmond's party has promised to introduce not-for-profit trusts as an alternative to private finance initiatives. He said these trusts would "crowd out" the use of private finance initiatives (PFIs) and public private partnerships (PPP). The SNP's manifesto makes it clear that councils and other public bodies would be able to choose how to fund building projects - leaving private finance an option. Mr Salmond said: "We think if we introduce our mechanism, the Scottish Public Service Trust, and bring it into the market place, then people will opt over time to take that cheap accountable mechanism, which will give 3% less on capital costs, and we will effectively crowd out PFI. "We don't want disruption in terms of people choice, we don't see the need to limit people choice, because no one in their right mind would want to opt for PFI when they can choose a service trust." Labour minister Alan Wilson said he would not accept the SNP's explanation. Mr Wilson said: "They [the SNP] had claimed previously that they could match the Labour programme brick-for-brick. "Obviously they couldn't and they have had a rethink and they are now copying Labour's policies. The Tories' Scottish leader, Annabel Goldie, said that private finance was producing funding for when the need arises. She added: "I think Alex Salmond has a lot of explaining to do about what his mechanism will involve, when we get the money and who is going to produce it." The Scottish Liberal Democrat leader Nicol Stephen said that the problem with the SNP plan was that it required approval from the UK Treasury. He added: "If we make capital investments and we are talking about billions of new investment, there is no point in getting into constitutional treacle and ending up with an immediate conflict with Westminster." Mr Stephen said that Mr Salmond had realised that if he were to cancel all existing school and hospital projects he knows how unpopular that would be right across Scotland.